Folks who read this blog and are not my mom, my husband, or Megan/Kate/Sharifah/Melissa/Mary might get the impression that I travel often. Well, listen up you other six readers: I don’t. I’ve posted recently about travels to India and to Ohio, but the truth is that I stay grounded most of the time and that’s how I like it. It was on a domestic flight in India in late 2012 that my mild discomfort with flying developed into full-blown dislike. I was trading momoir-type stories and novels with an Israeli woman when our plane dropped suddenly, about 50 feet, en route from Madurai to Mumbai. I’m guessing on exactly how many feet we lost, exactly, but the sensation was unmistakable. It felt like the bottom had dropped out from underneath us. 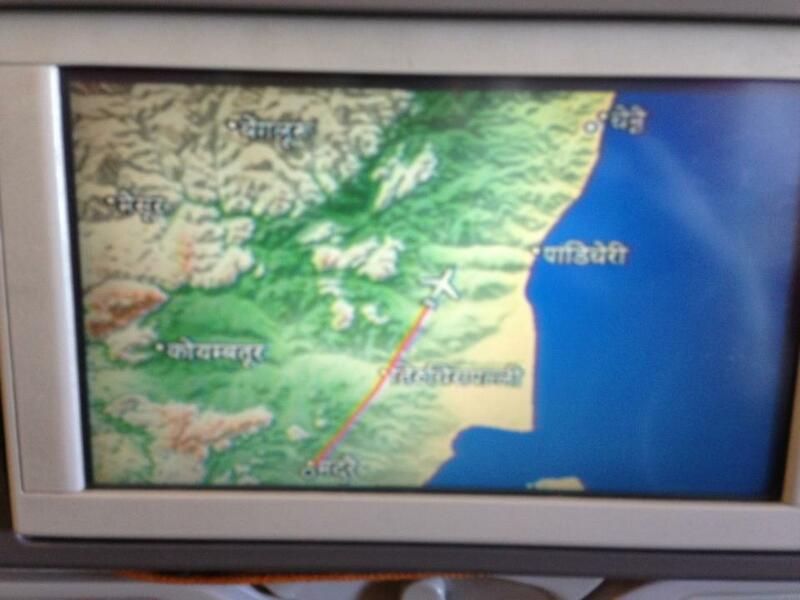 For two gut-churning moments … Then the plane settled and we were onward to Mumbai without further incident. All over the plane people kept watching their TVs – a movie about an atheist academic who becomes ill and meets God who just happens to be a motorcycle-riding Bollywood stud was the people’s choice on Spice Jet that day – and reading their books and talking their conversations in a half-dozen languages. I did not take this picture, and this woman does not endorse me. Yet. I needed some help readjusting. I looked to my new travel friend for confirmation that the turbulence that had just rocked my worldview really happened. “No, that didn’t feel good,” she said to me in a slow exhale before I even asked the question across that narrow aisle. I discounted his perspective immediately because, of course, life is a lark and anything is possible and planes don’t crash – when you are hanging out with Tina Fey. That book is funny. I inhaled it in a few short hours in Kerala, and I’m sure people were wondering: “Who is that American woman with little Justin Bieber and why is she drooling and laughing in such an unseemly manner?” Thanks, Tina. Nonetheless, the plane had dropped just a little and the air had shifted within my row of seats, opening this space in my mind where quiet fears of flying and terrorists in airports and disasters that prey on families leapt from black-and-white into Technicolor. My new friend talked, just for a few moments, about phone calls home to her three young children after a bus bombing in her hometown of Tel Aviv. She said it was hard to be away. But she took heart in knowing that her older child sought permission from a teacher, after the sirens went off, to find his youngest sibling in the neighboring school complex and tell her he was safe and things would be okay. Mom was away and the sirens went off and he just knew what to do. We said “goodbye” within 90 minutes of the turbulence, and I’ve flown a few times since then – New Orleans, Austin, Dayton, Minneapolis. But I don’t recall ever being much afraid of flying before that November flight. I tasted just one drop of terror in the air and I’ll be looking for the rest of the bottle – one eye open – forever after. Flight 370, Where are You? So I can’t look away from any new headline about Flight 370, and I can’t stop wondering why there aren’t more headlines and asking how it’s possible that we don’t know more. I can still find my metallic square of an iPod anytime, anywhere, but a jumbo jet disappears from the air? Then there are the front-page biographies of the flight’s missing passengers: A Canadian-Chinese couple were making snow angels with their little boys just a few weeks ago. Then they were on a getaway for two to Vietnam. A French woman, traveling with her teenage children and her son’s girlfriend. Even the Iranian mother in Germany waiting to start a new life with her son. He and his stolen passport are vanished. They remind me of my relief that a trip-for-six to India is – probably – 15 months away. They remind me that my eldest wants to attend international school in Africa, India, anywhere else. Could I ever let him? Maybe that’s the only ordinary thing about Flight 370 – how it tugs open a pocket of terror in my imagination that I’m forever trying to stitch shut. Current events have a way of wearing that thread bare again and again, admonishing me to pray for the people to whom these things happen while believing they probably won’t happen to me or mine. Until then, I’ll keep reading the headlines and hoping, praying, wishing hard that Flight 370 is a story that ends better than anyone of us can imagine. None of us has ever read this one before. Previous MAXImum Insecurity: the business of buying lady stuff Next Everybody Was Irish on Monday. Now What?